And so we set out for the home of Dora and Carl Dillistone in Turley Mill, a heavily wooded area about 20 minutes from town, named for the distiller of Taos Lightning, the oldest spirit brand in America. The house is a sprawling one-story structure a few steps from Dora’s studio (I didn’t know this at the time, but she is an accomplished artist whose work I’ve since discussed in “Under the Radar”). 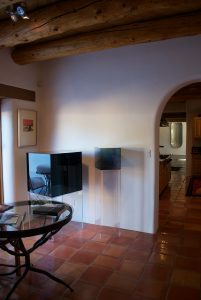 It wasn’t, however, the architecture or the handsome furnishings that snagged my attention; it was the art. To my left as I entered, I recognized a couple of Larry Bell cubes. I also spied a Bell “light knot”—one of the airy suspended sculptures he’s been working on for the last few years—hanging in the living room, along with works I by color field painter Dan Christensen. 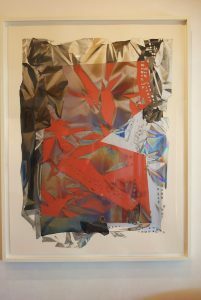 Some of the more astonishing pieces were completely new to me: several monumental canvases by Dorothy Hood, a reigning presence of the Houston art scene whose retrospective I wrote about for the site in September 2016, and large shiny structures by Christian Eckart, a Canadian-born artist who now lives in Houston. 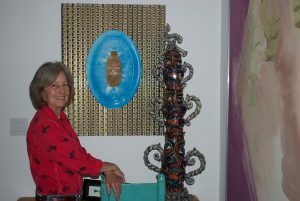 The Taos-Houston connection is important to the Dillistones, who lived in Texas for many years before transplanting permanently to Taos (Dora has been an artist for most of her adult life; Carl is a retired oil-and-gas executive). Their collecting, in fact, starts with Bell, who has lived in Taos since the 1970s but was showing in a Houston gallery in the mid-1980s. They bought one of his collages, made through the vacuum process that underlies almost all his output, from the small “Fractions” to the larger cubes and even the installation on the rooftop of the Whitney, which is now part of the 2017 Biennial. “That was the beginning,” says Dora. “I had the opportunity to come out here and do a workshop with Larry. That’s when we really got serious about the work. 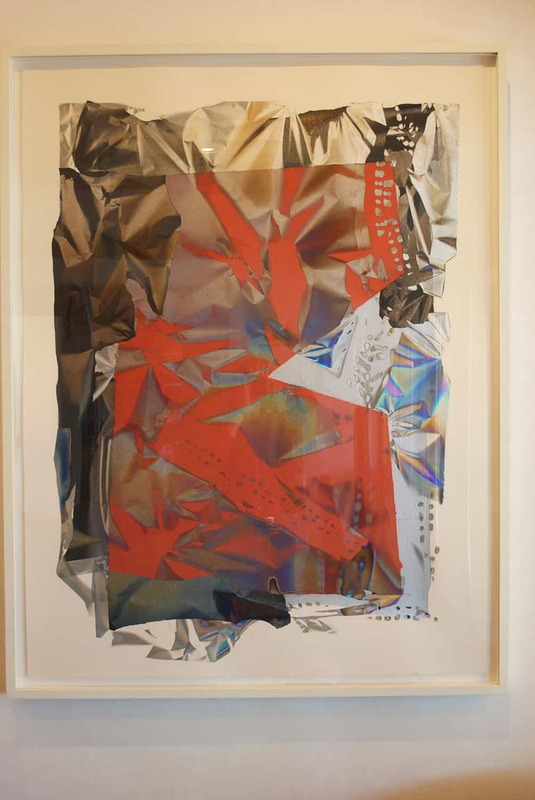 Dillistone has also taken classes with Eckart, whose works incorporate shiny reflective surfaces and whose writings reveal a man deeply engaged with the spiritual in art, and how that can translate into contemporary terms by way of highly abstracted forms. 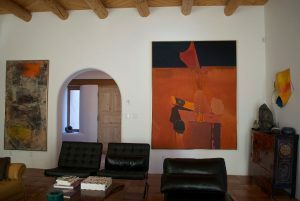 In a small sitting room off the kitchen, for example, the Dillistones have positioned his Perturbation, almost an upside-down cross, next to a Russian icon and another Eckart piece called Simple Model, made of gold leaf. And the juxtapositions feel entirely right. Though the couple were aware of Dorothy Hood for a couple of decades before her death in 2000, they did not begin to acquire her work until later in the artist’s life. As I wrote about her several months ago, she was one of those who fell between the cracks of art history, with not one but two strikes against her: she was female, and she matured far from the mainstream buzz and star-making opportunities of the New York art world in the heyday of Abstract Expressionism and Clement Greenberg’s formalist edicts. 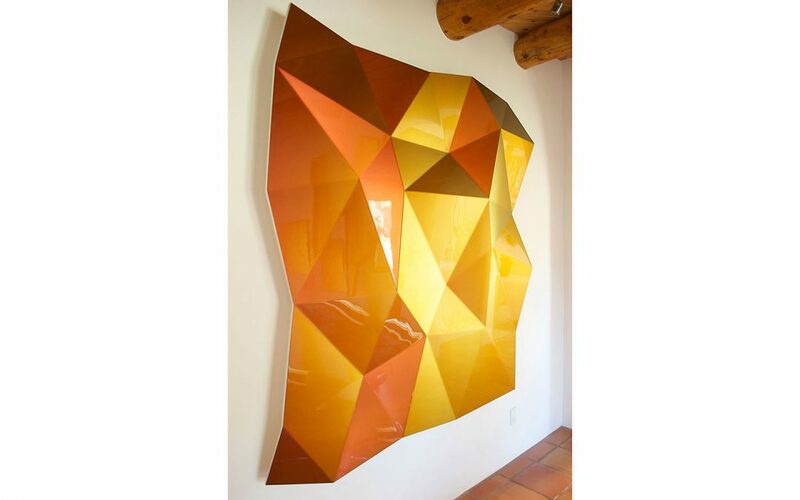 Top: a detail of Christian Eckart’s Hexagonal Perturbation (2011), extreme effect urethane on aluminum.